Now in addition to understanding the structures of the brain, which we could say is like understanding the hardware and the wiring that connects the various parts in a computer, we need to understand what kind of signals are passing along the wires in order to understand what those signals are telling the hardware to do. Scientists have primarily used the electroencephalogram (EEG) to try and develop an understanding of the electrical signals that pass between brain cells, groups of brain cells and different centres in the brain. It’s time for a mini-crash course in brain electrical rhythms or “brain waves”. Normally occurs in adults who are in “slow wave” sleep but also seen normally in babies. In adults it can occur over a region of the brain where there has been damage to the brain tissue below the cortex. It can be seen more diffusely when the entire brain is affected such as in serious illnesses that affect the metabolism of the whole brain for example “metabolic encephalopathy” or hydrocephalus. In children it occurs in the frontal regions whereas in adults it is seen over the posterior aspects of the brain. Theta normally occurs in young children. It can also be seen when an older child or adults is drowsy OR aroused. Several studies have shown it to occur in meditation. It occurs with a generalized distribution in disorders that affect the whole brain such as metabolic encephalopathy or hydrocephalus. However it occurs over the frontal midline area of the brain in association with focused attention in normal people. It has also been shown to occur in normal people who are in a relaxed, meditative, or creative state. This was the first category, or rhythm, of brain waves to be documented almost 100 hundred years ago. It is seen most in the posterior regions of the head on both sides. For some reason it emerges with closing of the eyes and with relaxation, and reduces when the eyes are opened or with mental exertion. In young children the alpha rhythm maintains its characteristic shape but can often get slower than the official lower limit for the frequency of 8 Hz. There are other normal alpha rhythms that occur in different areas other than the back of the head. For example there is the “mu rhythm” (which is actually alpha activity in the relevant sensory and motor cortical areas that happens when the arms/hands are not doing anything). Another is the “third rhythm” (which is actually alpha activity occurring in the temporal or frontal lobes). In coma alpha rhythm can occur over the whole surface of the brain but is not responsive to external stimuli. This is often called “alpha coma”. Usually occurs symmetrically on both sides and is usually most prominent at the front. It is often associated with active, busy or anxious thinking and active concentration, usually with a low amplitude. 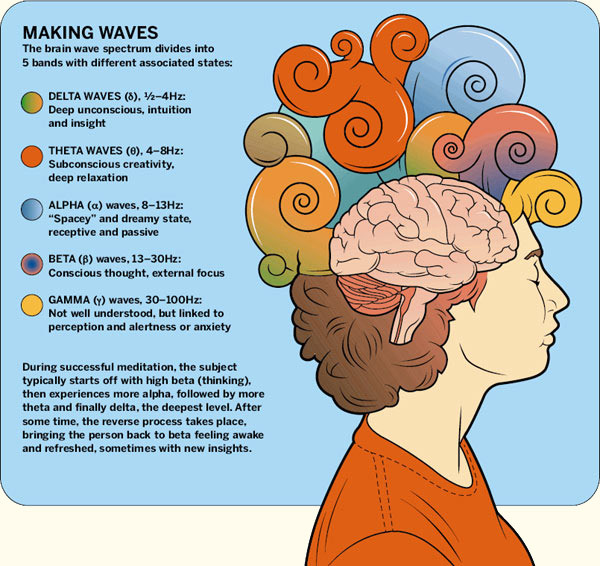 A different character of beta wave occurs, which is rhythmic, has a dominant set of frequencies in association with certain illnesses but also the effects of drugs such as benzodiazepines. It is the main rhythm in people who are alert or anxious or who have their eyes open. This is thought to occur when a person is involved in an effortful mental or physical task, triggering different populations of neurons (ie brain regions) to work together to create a network to accomplish that task.